FROM the initial ‘Grease is the Word’, the whole cast set the standard of throwing out the sound, the moves and the showmanship, ending the first act with an impressive ‘We Go Together’ and utterly nailing the doo-wop lyrics in the process. The “Pink Ladies” chorus in ‘Summer Nights’ was a blast but Niall Edwards as Doody stole the first half with his performance of ‘Those Magic Changes’. Always a favourite, the ‘Greased Lighting’ scene looked slick and Rizzo, played by Kirsty Vale, was fabulously bitchy and really belted out the numbers. The second half ran just as fast with great dancing ‘At the High School Bop’ and the finale’s ‘You’re the One that I Want’ was full of enjoyment and energy and choreographed perfectly. Individual performances were great all round with many stand out moments. Nathan Chapman as Danny singing ‘Sandy’ squared up admirably to Travolta’s memorable film version and Jarrad Heath provided a brilliantly rebellious Kenickie. 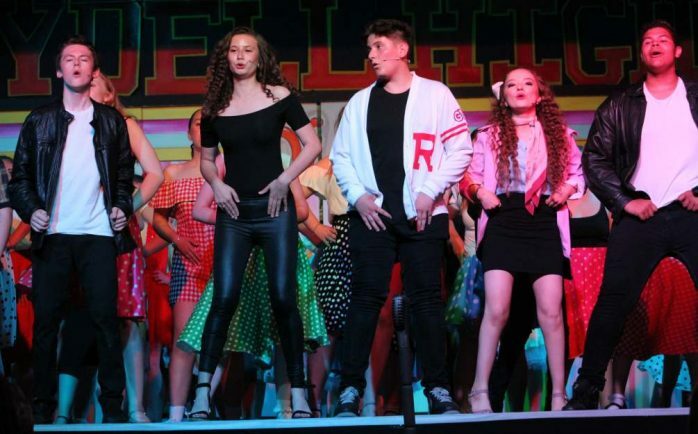 Hollie Troth as Sandy before her transformation singing ‘Hopelessly Devoted to You’ was perfect, as were the Teen Angels, Mary Thacker and Emily Tullett singing a very affecting ‘Beauty School Drop Out’ with Lawren Thornewell as Frenchy. Mr Rushton’s (Studley High English teacher) Johnny Casino singing ‘Hand Jive’ deserves to go down in history. It seems to have been a whole school effort and more, with set design, back stage crew and a wonderful live band all adding to a brilliant show. A coup for musical director Miss Bussey and director Olivia Hinde.